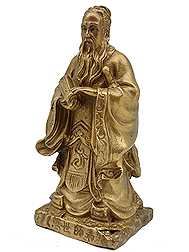 Confucius is the latinized word for Kung Fu Tzu who was a philosopher who lived 551-479BC. He is the greatest sage on earth who had been revered through ages, chiefly noted as a teacher who had written many titles of wisdom. He was a great thinker and educator and the founder of Confucianism. He was the 1st educator who started a private school and is said to have thought more than 3000 disciples and that there were 72 outstanding students among them who were famous historical figures themselves later. He was considered the master of all teachers with his rich educating concepts and epigrams. 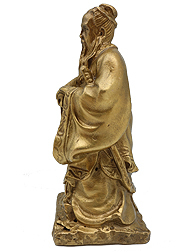 Placing the figurine of Confucius has a special advantage. Besides catalysing the excellent side of Wen Chang Scholastic Star, he can neutralize any evil or weak effects of the star. Having him in our space enable us to think out-of-the-box, foresee the unforeseen, defeat our competitors, leap frog to the next level of excellence and heighten our wisdom. 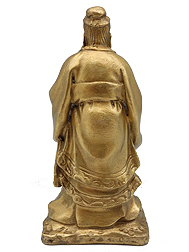 His figurine is best to activate education/ examination/ career/ business/ political strategic paths in the NE or ones Fu Wei location or the Star #4 position at home. 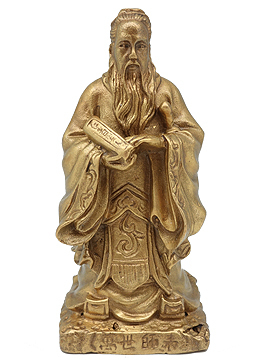 His figurine is also great for those in the field of writing such as authors, reporters and communications. 1. The Universe is regulated by an Order which is moral in its essence. 2. Man is morally good by nature, and it rests with him to remain so. 3. Man errs from ignorance and the force of bad example. 4. The remedies are education of the official classes and good example set by them. 5. The individual must rectify himself before he can rectify others. He must study the teachings of the Ancients and be well versed in modern ritualistic rules and social observances. 6. Above all it is essential to cultivate the Five Virtues viz., benevolence, justice, propriety, wisdom and sincerity. 1. In your study rooms, study table, work rooms, offices, writing rooms and decision making areas. Best to activate your examination luck and catalyze interest in studying. 2. 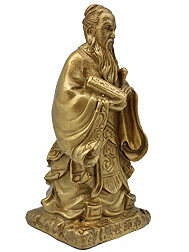 Important areas of your living rooms and family rooms especially in the NE for those who are seeking wisdom and position of Flying Star #4 or ones Fu Wei position for those who are seeking literary luck to tap excellent Feng Shui luck and energies.